PLEASE USE EXTREME CARE AND CAUTION IN THE DISPLAY AND USE OF THIS BOOK. DO NOT LEAVE IT WHERE IT CAN BE LOCATED, ACCESSED OR UTILIZED BY ANY UNAUTHORIZED PERSON. The following list is a compilation of words and phrases that have been taken from a variety of sources that are utilized in the research and following of Street Gangs and Security Threat Groups. The information that is contained here is the most accurate and current that is presently available. If you are a recipient of this book, you are asked to review it and comment on its usefulness. If you have something that you feel should be included, please submit it so it may be added to future updates. Please note: the information here is to be used as an aid in the interpretation of Street Gangs and Security Threat Groups communication. Words and meanings change constantly. monster of 168 pages in 11-pitch font. 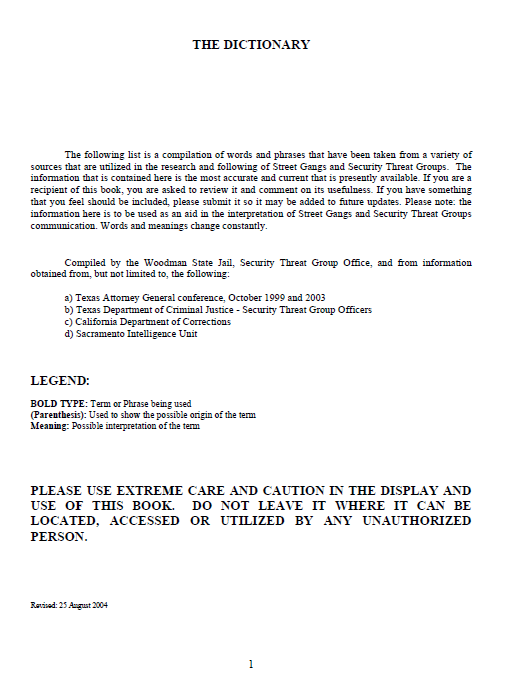 using other sources, which include the Attorney General’s gang web site and others. to benefit from this information.